Syrian president Bashar al-Assad has apparently retained the hope of a military return to Lebanon from where he summarily withdrew in 2005 following the Rafiq Hariri assassination. In a 2008 interview with a Lebanese newspaper, he accused the northern city of Tripoli of becoming a base for Islamists who posed a direct threat to Syria's security. 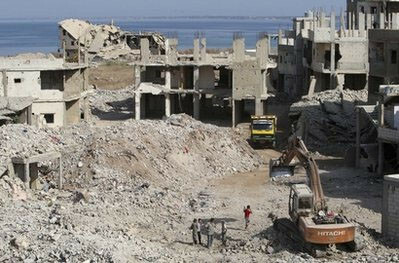 More recently, Rifat Eid, head of Tripoli's Alawite Arab Democratic Party, described the city as the "Lebanese Kandahar." The destruction of the Islamist group, Fatah al-Islam, by the Lebanese army in the Nahr al-Barid Palestinian refugee camp in May to September 2007 delivered a crippling blow to the radical Salafi movement in the Tripoli area. These charges could not be further from the truth. Far from posing a threat to its immediate neighborhood, let alone to Syrian security, Tripoli's hopelessly fragmented Salafi movement is primarily non-combative, its more militant groups having long been defeated and pacified. Its devout and conservative nature notwithstanding, this movement is very much a cathartic reaction to the city's prolonged political marginalization and economic deprivation. To exaggerate the threat of Tripoli's Salafis is tantamount to fattening the sheep before the slaughter. From its founding by the Phoenician seafarers in the eighth century BCE to the collapse of the Ottoman Empire in 1918, Tripoli maintained its status as one of the foremost cities in the eastern Mediterranean. During the Arab-Islamic era, its port was second only to Alexandria's, serving at different periods as the economic lifeline of Aleppo, Damascus, and Baghdad. This privileged status came to an abrupt end in the wake of World War I when Tripoli's inclusion in Lebanon—against the will of its Muslim population, which would rather have been included in Syria—instantly marginalized the city. In its place, Beirut rose to prominence as the capital of the new political entity and the major site of its economy. Likewise, for some Maronite nationalists, Tripoli's inclusion in Lebanon threatened the slight Christian majority reported by the 1932 population census. The leader of the National Bloc, Emile Edde, for example, demanded the incorporation of Tripoli and its environs into Syria in order to preserve Maronite political predominance. For their part, the French, who created modern Lebanon as an essentially Christian state, had little interest in maintaining the leading political, social, and commercial standing of predominantly Sunni Tripoli, and the city's economic suppression during the French mandate (1920-43) became a tacit policy of the Lebanese state after independence. Still, Tripoli managed to reemerge as a provincial hub, unencumbered by the stress of the country's Beirut-based divisive confessional politics, serving the economic, educational, medical, and commercial needs of northern Lebanon and northwestern Syria. This, however, was not due to government policy but rather to private investments by northern Lebanese and the influx of Syrian capital after the introduction of nationalization measures in that country. Tripoli is often referred to as the seat of Lebanon's multifaceted Salafi trend, whose genesis coincides with the withdrawal of the last French mandate troops from the country in 1946. Home to the first Salafi reformer Rashid Rida (1865-1935), this profoundly conservative and devout city remained a rare oasis of religious and cultural diversity until the mid-1970s. This was a place where, despite infrequent social, interfaith interaction, Christian missionary schools proliferated and central roads and boulevards bore decidedly Christian names such as Nuns Street, Churches Street, Archbishop Street, and Saint Elias Street. In Tripoli, Islamic religiosity tolerated the existence of Lebanon's only gambling club (known as Cheval Blanc Casino) long before the opening of Casino du Liban in 1959. Taverns and cabarets stood alongside mosques and religious institutes without a hitch. The advent of religious organizations on a considerable scale during the 1950s and 1960s did not radicalize Tripoli or reduce its toleration of religious and cultural diversity. Egypt's Muslim Brotherhood launched its activities in the city in 1956 under the name of Ibadurrahman (Servants of God). In 1964, Fathi Yakan transformed the group into al-Jama'a al-Islamiya (Islamic Group), which operated as a non-dissident and charitable movement. However, the repercussions of the 1967 Six-Day War with Israel altered the city's collective psyche and swayed it toward Islamism. This coincided with the militarization of the Lebanese Maronites, who were heartened by Israel's stunning victory as they sought to stem the growing tide of armed Palestinian groups. Lebanon was now on the fast track to civil war. Tripoli had its share of the civil war, which raged in Lebanon from 1975 to 1989. Initial setbacks at the hands of the Syrian-supported Maronite Mirada militia of then-president Suleiman Franjiyye and the inability of Tripoli's small pan-Arab and leftist parties successfully to confront them on the battlefield, encouraged the rise of jihadist movements. Sheikh Salim ash-Shahhal, who in 1947 had founded the country's first Salafi movement al-Jama'a Muslimun (literally meaning "the group is Muslim"), transformed it into a modest military force in 1976 under the name of Nuwwat al-Jaysh al-Islami (Nucleus of the Islamic Army). Other small groups such as al-Muqawama ash-Shaabiya (Popular Resistance), Harakat Lubnan al-Arabi (Movement for Arab Lebanon) and Jundullah (Warriors of God) splintered from al-Jama'a al-Islamiya and joined Tripoli's burgeoning Harakat at-Tawhid al-Islami (Islamic Unity Movement) under the leadership of Sheikh Said Shaaban, who eventually transformed the city into an Islamic emirate between 1983 and 1985. Outward manifestations of modernity disappeared with the imposition of a total ban on the sale of alcoholic beverages as well as the shuttering of movie theaters, European-style roadside cafes, and tennis and golf courts. Shaaban took advantage of the rising pan-Islamist sentiment among Tripoli's religious and conservative population. He received a major boost from the success of the Islamic revolution in Iran, with which he identified, and from whose financial largesse he benefitted. He also relied heavily on the financial and military support of Yasser Arafat's Fatah movement, which maintained a strong military presence in Tripoli, especially in nearby Nahr al-Barid and al-Baddawi Palestinian refugee camps. During Israel's 1982 invasion of Lebanon, Yakan created two guerrilla movements to combat the Israeli Defense Forces (IDF): al-Mujahideen (The Jihadists) in Tripoli and al-Fajr (Dawn) in Sidon. The Israeli eviction of the Palestine Liberation Organization from southern Lebanon and Beirut in 1982 and the Syrian expulsion of Fatah guerrillas from Tripoli in 1983 were followed in 1985 by a withering assault by Syrian allies against at-Tawhid forces, which ended in destroying the movement's military machine. The anti-at-Tawhid coalition included the Baath Party, the Communist Party, the Syrian Social Nationalist Party, and the Alawite Arab Democratic Party. Syrian intelligence operatives and Lebanese Alawites raided at-Tawhid's stronghold in Bab at-Tibbane and massacred some six hundred Sunnis. This singular incident caused an enduring schism between Tripoli and the Syrian regime and served as an impetus for the subsequent emergence of extremely radical jihadist groups, especially Usbat an-Nur (Partisans of the Divine Light) of Sheikh Hisham ash-Sharidi, assassinated by Fatah operatives in 1991. The more lethal Islamist Abdulkarim as-Saadi took over the group and reintroduced it as Usbat al-Ansar (The Partisans League). Embittered by the 1985 events, Tripoli's Salafi movement gathered momentum with the end of the civil war, which prompted many northern Lebanese clerics to return from Saudi Arabia where they had been schooled in radical Wahhabi-type religious training. In 1995, these Islamists killed Nizar Halabi, head of the pro-Syrian and Sufi-inspired Jam'iyat al-Mashari al-Khayriya al-Islamiya (Association of Islamic Charitable Projects, known as the Ahbash), triggering a harsh government response. Many Islamists fled to the Dinniye Mountain east of Tripoli and regrouped into a 300-man strong radical movement. Their excommunicatory ideology toward moderate Muslims and rejection of non-Muslims in line with the religious edicts of Ibn Taymiyah, the famously radical medieval scholar, outraged the government and invited its wrath. In January 2000, the Lebanese army routed the group, killed its leader Bassam al-Kanj and apprehended dozens of combatants. Others sought refuge in Ein al-Hilwa Palestinian refugee camp near Sidon. The Lebanese authorities pardoned jailed Salafis shortly after the assassination of former prime minister Rafiq Hariri in 2005. In fact, Saad Hariri, who succeeded his slain father as leader of the Future Trend movement, opened up to radical Sunni movements with the prodding of Riyadh, which wanted to ensure that Sunnis were capable of standing up to the Iranian-backed Shiite Hezbollah. Salafi movements sprang up in Tripoli's poor neighborhoods such as Bab at-Tibbane, as-Suwayqa, Abi Samra, and at-Tal. The sight of heavily bearded, armed young men and turbaned Salafis striding in alleys made the once bustling city austere and unwelcoming. The Hariri assassination amounted to a coup that blunted the Saudis' thrust into Lebanon and reaffirmed the preeminence of the Syrian-Hezbollah entente. Riyadh's response came in the form of arming Tripoli's Salafis so as to allow them to stand up to Hezbollah. As noted by the Lebanese daily al-Akhbar, "the regional underpinnings of Tripoli's surging jihadist Salafists are directly linked to the conflict between Damascus and Riyadh over controlling Lebanon." Indeed, while being bankrolled by Qatar, Kuwait, and the United Arab Emirates, "every single activity by any Salafi movement is doomed to failure if it doesn't receive Saudi support." Saudi aid is presently funneled through the ministry of religious endowments and a number of private associations whose activities are closely monitored by the government. Philanthropic associations promoting jihad, such as al-Haramain, have been discontinued after the 9/11 attacks. The ease with which Hezbollah managed to defeat Hariri's al-Mustaqbal militia in Beirut in 2008 convinced the Saudi leadership that they could not rely on northern Lebanese Salafis, who formed the backbone of the prime minister's militia, to serve as a countervailing military force to Hezbollah. They have thus curtailed most of their military assistance and contented themselves with promoting as-Salafiya al-Ilmiya, or official Salafi, that eschews involvement in politics. So did the other Gulf Cooperation Council states, which support Tripoli's as-Salafiya al-Irja'iya, the Salafi preaching group that separates belief and action and limits itself to the former. The destruction of Fatah al-Islam by the Lebanese army in the Nahr al-Barid Palestinian refugee camp in May to September 2007 delivered a crippling blow to as-Salafiya al-Jihadiya (Jihadist Salafi), whose remnants had gone underground into sleeper cells. Having made its debut in the refugee camp in 2006, Fatah al-Islam doubled its initial strength of 150 fighters within less than a year as the army intelligence's persecution of young, northern Lebanese Sunnis, who asked for weapons to counter the Shiite power surge, drove them into the arms of the newly-established militant group. The growth, however, of this millennial movement was preventable. Fatah al-Islam's rise attests to the clumsiness of Lebanese army intelligence and the heavy army and civilian toll during the Nahr al-Barid fighting. Lebanese Salafis lay the blame on Hezbollah for refusing to involve them in confronting the IDF and its South Lebanon Army surrogate, accusing Hezbollah of pretentiously labeling itself "al-Muqawama al-Islamiya" (Islamic Resistance). In response to the denial of their access to the anti-Israel military campaign, the Salafis directed their energies against the national government. In support of Hezbollah during the 2006 summer war against Israel, Yakan, the leader of the Tripoli-based Islamic Group, established the Islamic Action Front that included five pro-Syrian Sunni Islamic groups: the two factions of Tripoli's at-Tawhid movement of Hashem Minqara and Bilal Shaaban, al-Fajr forces of Abdullah at-Tiryaqi, Abdel Nasser Jabri's Islamic group in Beirut, and Zuhair Jaid in the Shuf Mountains. The front disintegrated shortly after Yakan's death when cofounder Hashem Minqara deemed it no longer viable because some of its leaders were simply using it for political and financial gain. When the fighting raged in Tripoli in May 2008 between Sunnis and Alawites, the founder of the Salafi movement, Dai al-Islam ash-Shahhal, exhorted "all committed Lebanese Muslim young men to prepare psychologically and logistically to embark upon a new period [of armed resistance]." He made it clear that he was not looking for volunteers from abroad but "direly needed financial assistance." Later, as the final showdown loomed large in connection with the Hariri assassination indictments, Shahhal warned Hezbollah against "inciting Sunni fratricide in order to render the sect politically irrelevant." Yet for all his exertions, he failed to persuade the Saudis to resume their financial support for rebuilding the Salafis' military machine. Tripoli has no place on the Lebanese economic, developmental, and tourist map as its name "has become synonymous with poverty, misery, and deprivation." With free medical services virtually nonexistent, and minimum monthly wages often as low as $170, compared to the average Lebanese wage of $335; with a youth unemployment rate of 45 percent and a truancy rate that exceeds 20 percent, it is not difficult to understand why Tripoli is such an ideal breeding ground for Salafis. Whereas 28 percent of the Lebanese population is below the poverty line, in Tripoli, it is 57 percent. Annual per capita expenditure in Lebanon averages $2,700, but in Tripoli it is $1,700—compared to $4,300 in Beirut. With 9,700 persons per square kilometer, it is overcrowded. Tripoli's economic decline dates back to the 1970s when the city suffered a number of severe blows: Iraq's construction of the Basra offshore oil terminal and the Kirkuk pipeline terminal in Turkey's Ceyhan rendered Tripoli's terminal useless. The city's decaying oil refinery, which previously provided about 40 percent of Lebanon's annual refined oil needs, was permanently shut down in 1993. Its full rehabilitation at an estimated cost of $300 million can save the country up to $ 1.2 billion from the importation of refined oil derivatives. Nevertheless, there is a long-standing Lebanese policy against government investment in the city. In addition, Beirut receives 83 percent of Lebanon's total banking credit compared to Tripoli's 2 percent. Since 1975, Tripoli has lost 80 percent of its economy. Forty percent was lost in 1989 alone as a result of the Assad government's decision to allow the Syrian private sector to import from the international market. While the civil war cut off Tripoli from its traditional northern Lebanese, Christian market, the Syrians severed all economic and social ties between the city and the cities of Homs, Hama, and Tartus. The scarcity of employment opportunities has negatively shaped the worldview of many of Tripoli's young men and motivated them to seek salvation in religious extremism. Representatives from six moderate, northern Lebanese Salafi movements disapproved of Fatah al-Islam's militancy that culminated in the May 2007 all-out confrontation with the Lebanese army. The joint statement they issued underlined that Shari'a (Islamic law) stresses, among other things, the preservation of the pillars of dignified human living that include religion, family honor, personal safety, and pecuniary assets. The unequivocal statement called for an immediate end to the fighting, eviction of the radicals from the Nahr al-Barid refugee camp, and promotion of allegiance to state authority. Combating jihadists remind many Tripoli residents, including benign Salafis, of the three dark years of terror when at-Tawhid reigned supreme in the city. Their religiosity notwithstanding, most Tripoli residents are averse to the imposition of Shari'a rule in the city. People in Tripoli's depressed areas have little faith in the government and exhibit unmistakable disenchantment with the willingness of the Lebanese political system to redeem them. The city may be a bastion of the Salafi movement, but its roots are essentially non-belligerent. Militancy is not entrenched as in some Shiite neighborhoods in Lebanon or in Islamist societies like Yemen or Somalia. Deconstructing the phenomenon of Tripoli's Islamic radicalism is clearly a function of integrating it economically and culturally in the Lebanese political system. It is quite remarkable that the city has not turned far worse after more than ninety years of deliberate marginalization. Hilal Khashan is a professor of political science at the American University of Beirut and the author of many books and articles on Arab politics including Arabs at the Crossroads: Political Identity and Nationalism (University Press of Florida, 2000). Al-Bayraq (Beirut), Sept. 30, 2008. Asharq al-Awsat (London), Oct. 7, 2010. Meir Zamir, Lebanon's Quest: The Road to Statehood 1926-1939 (London: I. B. Tauris, 1997), p. 107. Ash-Shiraa (Beirut), Nov. 7, 2010. Asharq al-Awsat, May 25, 2007. Al-Mustaqbal (Beirut), Dec. 5, 2007. Now Lebanon (Beirut), accessed Feb. 7, 2011. Al-Markazia (Beirut), accessed Dec. 2, 2010. Al-Akhbar (Beirut), June 8, 2010. Author interview with Rashid Jamali, former head of the Tripoli municipality, Tripoli, Dec. 18, 2010. Al-Akhbar, Sept. 5, Oct. 21, 2010. King Abdulaziz Foundation for Research and Archives, Riyadh, accessed Feb. 5, 2011. Hana Ulayan, "At-Tayyarat al-Wahabiyya fish Shamal: bayna an-Nahj ad-Dini wal Maghnatis as-Sisyasi," Harakat at-Tawhid al-Islami-Majlis al-Qiyada website, Dec. 16, 2010. In March 1978, Israel invaded southern Lebanon, established a narrow security zone, and created the Southern Lebanese Army (SLA). It dismantled the SLA and unilaterally withdrew from the security zone in May 2000. Asharq al-Awsat, May 13, 2008. As-Safir (Beirut), Jan. 2, 2010. Talal Khuja, "Tarablus bayna al-Qal'a al-Mughlaqa wa-l-Madina al-Maftuha," Middle East Transparent website, Oct. 27, 2010. Al-Liwaa (Beirut), Jan. 10, 2011. Makram Sader, "Tatawur al-Qita al-Masrifi 1990-2010," Association of Banks in Lebanon, Beirut, Dec. 2010. Now Lebanon, May 22, 2007. Lebanese prime minister Najib Mikati's website, accessed Feb. 7, 2011. Related Topics: Lebanon, Radical Islam | Hilal Khashan | Spring 2011 MEQ receive the latest by email: subscribe to the free mef mailing list This text may be reposted or forwarded so long as it is presented as an integral whole with complete and accurate information provided about its author, date, place of publication, and original URL.